Level 1 (Easy). Pets theme clay modelling set. Includes 4 FIMO kids 42g clay blocks to make the toys shown and a modelling tool. Once toys are complete and baked to harden children can role play using background scene provided. 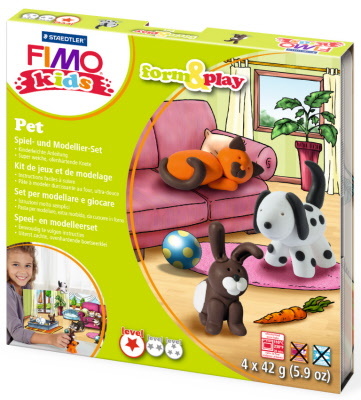 Contents: 4x FIMO kids 42g - White 0, Orange 4, Brown 7, Black 9, modelling tool, instruction booklet and background scene. Age 8+.